Salvador Dali will launch Little Kiss Me, a musky fruity floral flanker to 2008's Little Kiss fragrance (and see also: last year's Little Kiss Cherry). 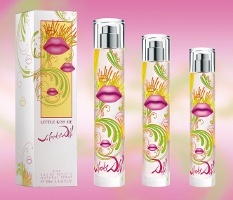 In LITTLE KISS ME, I adopted a joyful, lively and lighthearted signature to express the playful happiness that infects all women in summertime, tickling and titillating our senses in a deliciously mild effervescence. The notes feature nymphea, aquatic notes, bamboo, grains of paradise, peony, magnolia, passion flower, iris, woods and musk. I don’t know that I want to wear it, but the little girl in me is shrieking for that bottle. I think the lips are sort of… creepy. I love the Dali bottles. Didn’t realize there had been so darn many Dali launches in recent years. I tried to get Laguna from a discounter after Kevin’s review, but they were out of stock and I never tried again. I do have a mini of Dallisime (per Pyramus’s recommendation) and it’s an enjoyable fruity floral. Joe, I don’t know what is going on with the distribution of the Dali line in the US these days. Vaguely remember something about them making new arrangements & supposedly they were going to be easier to get? But seems to me they’re still hard to find outside of the discounters. I loved the first one (just called Dali, I think? ), even though I haven’t worn it in years. A family friend had gotten it for me in Paris, and I felt so proud to have such an exclusive scent, until I started seeing it in drugstores. Anyway, it seems like the line has steadily gone downhill. I really have tried so few I can’t comment. I love the bottles though! I love “Sea and Sun in Cadaques” – fragrance AND bottle – and I will probably try this as well, seeing it’s Celine Ellena. Dali must make something with coconut! But I don’t know. Cute. Watery florals intriguing. Doesn’t look like a sig. scent, though. Speaking of signatures, does Chanel no. 22 have churchy smoky incense, or is it a sharper contrast? It sounds like I’d love it, if the white flowers aren’t too cloying. Thanks Robin, I’ve just got to have a Chanel a floral woody girl would like. I’ve tried the OTC ones. Chanel 22 is not churchy to me at all. Have you read Angie’s review?